We’ve all heard it. Stay off your cell phone while driving. A Moline woman learned that lesson the hard way recently. Bettendorf police say Jennifer DeClerck, 24, admitted to texting on her cell phone just before her spectacular single-car crash on Interstate 74. DeClerck lost control of her vehicle. It then went into a ditch, hit the side of an on-ramp, went airborne, hit a tree and ended in a ditch on the other side of the on-ramp. DeClerck was extricated, then airlifted to a Davenport hospital. Can peace and beauty be found in the big city? Yes, at Vander Veer Park in Davenport. From the beautiful flower gardens, the Conservatory, the greenhouses, the fountain, the playground and the lagoon, Vander Veer is a Quad-Cities treasure. You may enjoy just sitting on a tree-shaded bench some weekend and watching the people go by. You never know what you might see. When I was there on Mother’s Day, a man was walking around with his 3-foot pet python hanging from his neck. My wife, Sherry, noted that you know you’ve lived a long time when a building you saw constructed years ago and acclaimed as being quite modern is now being torn down. That’s the case with the Professional Arts Building in Davenport. I cringe when candidates say, “If you elect me, I will create jobs.” Elected people don’t create jobs. Entrepreneurs do and only when there is a favorable climate for doing so. Elected people do, of course, have a stake in creating an environment that’s good or bad for doing business. As long as I am harping about my TV news friends, I get tired everyday hearing them talk about what someone posted on the station’s Facebook page. If I wanted to know what’s on their Facebook page, I’d read it myself. Please, please just give me the news. “Over” is a word that is often misused by many of us, including the media. When we mean “more than.” I returned to St. Ambrose for a year in my 30s to earn a second major in mass communications. My newspaper journalism instructor there, Julie Jensen McDonald, drilled into her students the difference between “over” and “more than.” People will often write or say something like, “The benefit raised over $5,000.” That’s wrong. Over refers to a place, as in, “The tree towered over the house.” Over does not refer to a quantity. The sentence should read, “The benefit raised more than $5,000.” OK, the curmudgeon reporter is now getting off his high horse – at least for now. My wife is retiring soon from 28 years of teaching. She would have logged 42 years had she not taken 14 years off to be a stay-at-home mom. As one who was “downsized” three years ago by Clear Channel, a communications company bleeding red ink, and now considers himself semi-retired, I think she’ll like retirement after a period of adjustment. I am looking forward to the daytime companionship — right now it’s just our cat Mistletoe and me, and she can’t carry a conversation. I also welcome the flexibility we’ll have for traveling. Dinner theater in New Era: What’s not to love? “Big River” play poster. Courtesy of Bill Turner’s Facebook page. 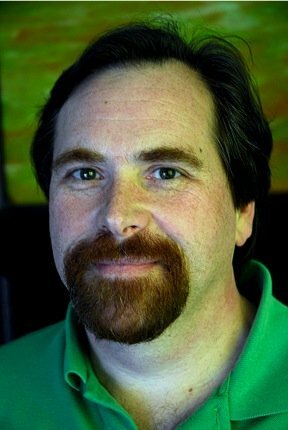 Former New Era actor and now play director, Bill Turner. Courtesy of Bill Turner’s Facebook page. Not much happens in tiny New Era, Iowa, located just a short distance from the south entrance to Wildcat Den State Park in Muscatine County. That’s appropriate; there’s really not much there. Just a few houses and a large old community hall that’s connected by a newer social hall to the picturesque New Era Lutheran Church. At dusk, the deer that wander out of the woods might well outnumber the people of New Era. There is one time, though, that New Era comes to life. That’s in May each year at a dinner theater hosted by the church. Guests sit down to a home-cooked meal in the social hall, then they move to the community hall to watch their friends and neighbors in a performance. It’s been an annual tradition since 1994. Proceeds go to charity. 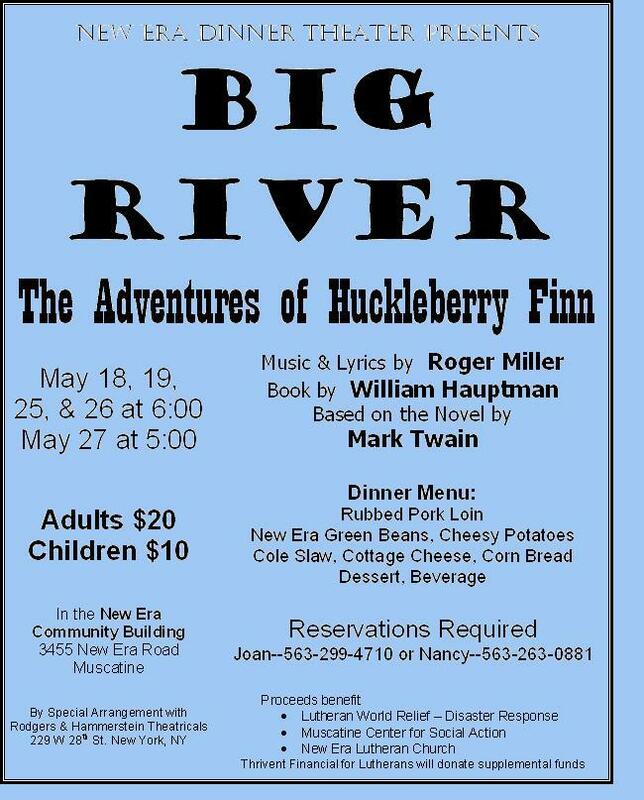 This year’s show is a musical, “Big River: the Adventures of Huckleberry Finn,” featuring the music of Roger Miller. And church member Bill Turner, 56, of Muscatine, returns for the 14th time as director after acting in four early New Era productions. After graduation, Turner worked in downtown Chicago for three years. But he and his wife decided they didn’t want to raise a family in the city or the suburbs. He is a business analyst at the company, now owned by Bridgestone. The couple have three children, Adam, Aaron and Kari. Adam and Kari are part of the “Big River” cast. Turner did some theater in high school but wasn’t involved as an adult until Adam, his oldest son and in middle school at the time, auditioned for a community theater part. Turner drove the boy to the audition. “They talked me into auditioning at the same time. I got a big part, and the rest is history,” Turner says with a laugh. Though he didn’t take part in New Era’s first production, “Godspell,” in 1994, Turner won the part of Jesus the next year in “Cotton Patch Gospel.” He then acted in plays the next three years before the director left, and he took that job. “I said I’d try it, and it went pretty well,” he says of directing. He hasn’t returned to the New Era stage except to sing in plays’ choruses several times. How does he deal with cast members who are worried about forgetting their lines? As a patron who has attended every production except the first one, I can tell you they do just that – have fun. “Big River” plays weekends only May 18 through May 26. For more information, call (563) 299-4710 or (563) 263-0881 or e-mail neweradinnertheater@gmail.com. Copyright 2012 by Phil Roberts, Creative Enterprises. Submitted to The North Scott Press as an “Everyday People” column. 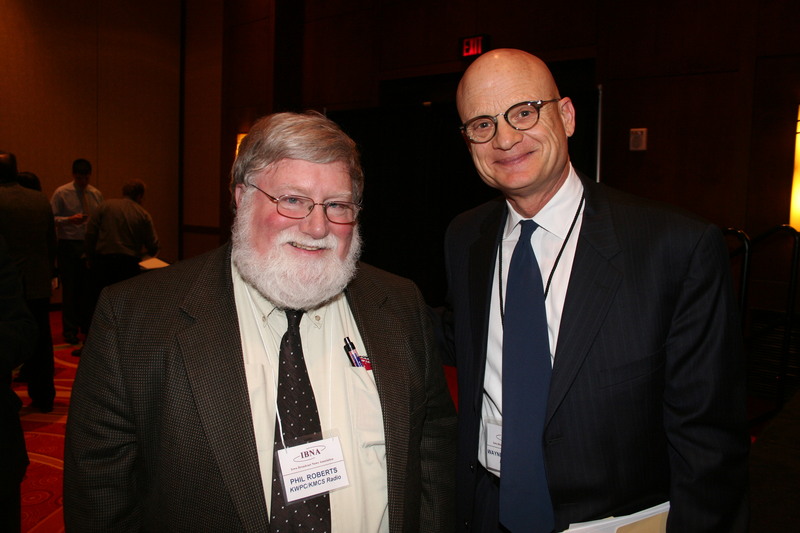 Phil Roberts (l) with Mike Grimm. Phil Roberts (l) with Wayne Freedman. 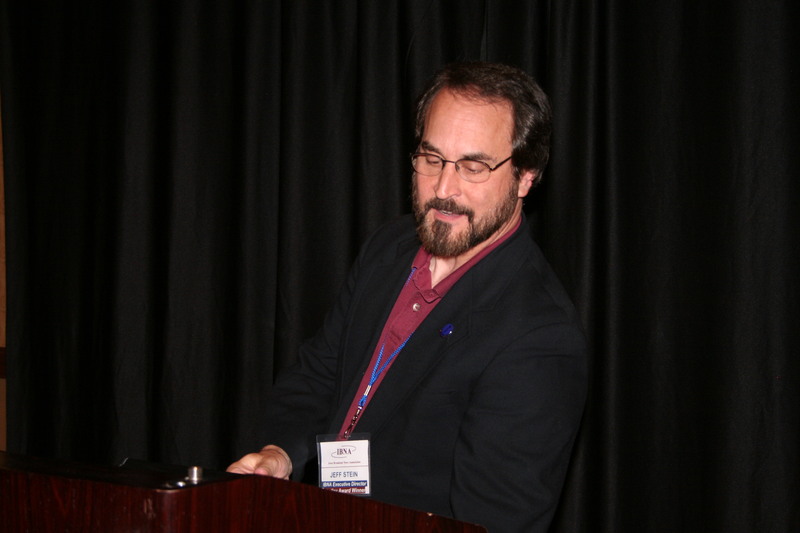 IBNA executive director Jeff Stein. Phil Roberts photo. Jean and Cary J. Hahn. Phil Roberts photo. 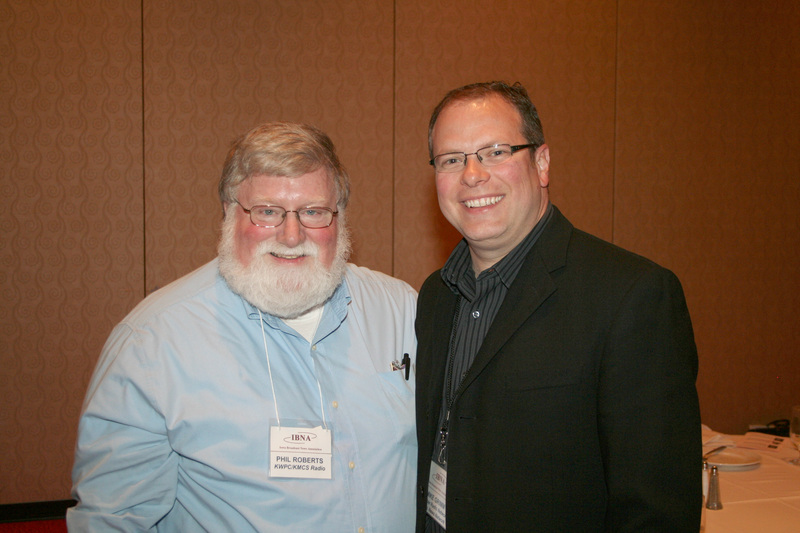 It was great seeing my longtime broadcasting friends Saturday, April 28, 2012, at the Iowa Broadcast News Association (ibna.org) convention, held this year in Coralville, Iowa. Thanks, too, to IBNA members for re-electing me to their Board of Directors as their Southeast Iowa representative. I was on the board earlier — in fact I’m a past IBNA president — but left in May 2009 when my one-year term ended. That was just a few weeks after I had been released from my news anchor/reporter job at WOC-AM in Davenport, Iowa, due to station owner Clear Channel’s sorry financial state. It was a pleasure finally meeting Mike Grimm, our luncheon speaker at the convention. Mike is formerly of WMT, Cedar Rapids, then KMOX, St. Louis, and now is the voice of the Minnesota Golden Gophers. When I handled media relations (1990-2001) for NASCAR’s Midwest-based All-Star Series, I provided racing news and results to Mike and his WMT boss, Ron Gonder. But we’d never met until Saturday. I also had the pleasure at lunch of sitting next to Wayne Freedman, a workshop presenter and our evening awards banquet keynote speaker. 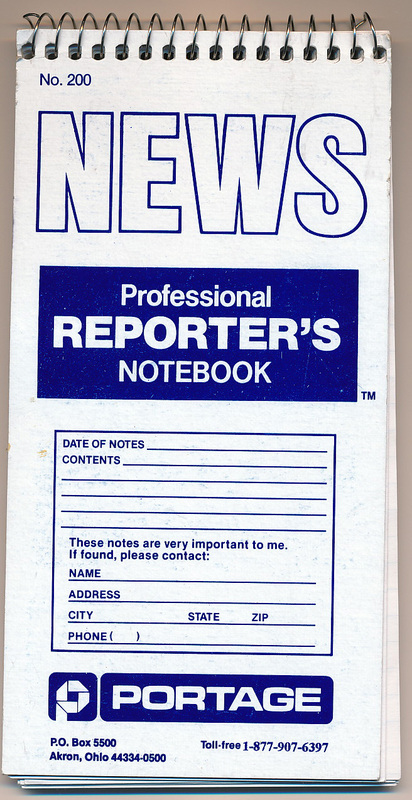 He is a fabled, many times award-winning San Francisco TV reporter — a great storyteller. He also produced features at one time for CBS News. At dinner, Cary J. and Jean Hahn, two of my favorite people, joined me. Cary and I are roughly the same age, share Missouri roots and have been through good times and bad times in broadcasting, a profession we both love. 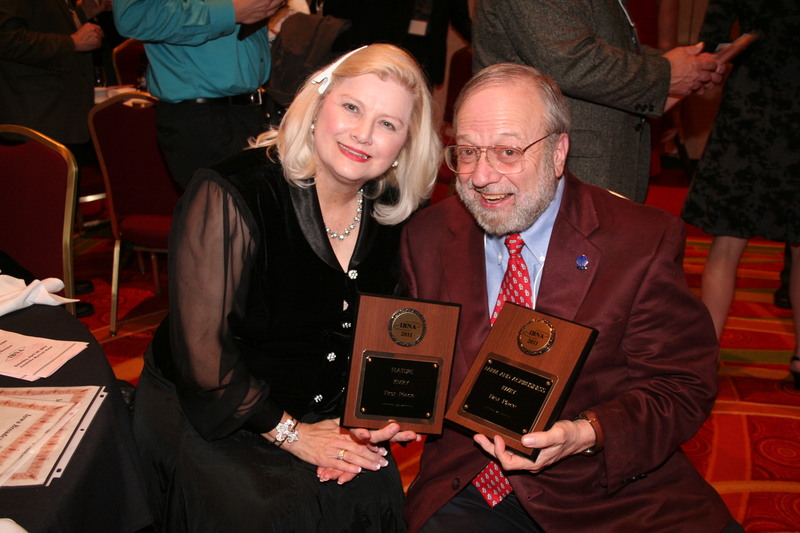 A former Shelley Award winner, Cary is the news director at KMRY-AM in Cedar Rapids. Thanks to IBNA executive director Jeff Stein of William Penn University and everyone else for a meaningful convention. See you April 20, 2013, in Johnston, Iowa!